Porec has over 100 years of experience in hospitality. The region offers rich cultural history, various fun activities, fine cafes and restaurants, rich night life, and mesmerizing sunsets. - Kastelir-Labinci: The two villages have been expanding together and merged into one municipality. Visit the Ethnographic museum for a history of the region. 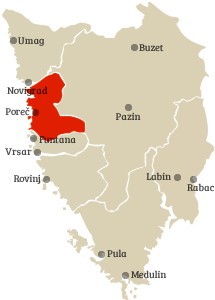 - Tar-Vabriga: Originally two settlements, Tar and Vabriga are joined into one town separated by the main road connecting Porec and Novigrad. This region is famous for exceptional olive oil. Head to Tar’s bell tower for panoramic views of Novigrad (north) and Porec (south). On the west coast of the Istrian Peninsula, the ancient town of Porec sits majestically on its own small stretch reaching into the sea. A military installation, or castrum, established by the Romans in the first century, it was later named the municipality Parentium. Its origin is still debated among experts between Greece, Illyrium, and Venice. Ruins harking back to the first century include the Temple of Neptune and Temple of Mars, emphasizing the city's historic past. Known for its stunning, sixth century Byzantine landmark, the Euphrasius Basilica stands today on a foundation built in the third century, complete with original floor mosaics. The Venetian, Gothic, and Baroque architectural influences are magnificent, with examples like Zucchato Palace, House of Two Saints, Parisi Gonano Lion House, Romanesque House, Sincic Palace, and many others lining the historic streets of the old town. The glorious age when Porec was the political center of Istria is reflected in the halls of the ornate Istrian Parliament. Today, classical concerts ring through the Euphrasius Basilica, wine enthusiasts gather during Vinistra in May to sip the region's best vintages, and vacationers enjoy a relaxing, comfortable, Mediterranean resort with great local cuisine and fascinating art, both ancient and contemporary. - Porec Old Town: Explore the old town, especially the pedestrian-only Eufrazijeva and Decumanus streets. - St. Euphrasius Basilica: Located in the city center, the sixth century Basilica is a real jewel. - District Museum (Zavicajni Muzej): Located in the 18th century Baroque palace. This is the oldest museum in Istria, dating back to 1884. - Istrian Council House: For over a century, this was the home of Istrian Parliament assemblies and District Parliament still holds its formal sessions here. The Istrian council house was originally a Gothic Franciscan Church from the 13th century. - Romanesque House: Dates back to 13th century and is now used as an art gallery. - Pentagonal Tower: Old tower offering great food with a great view. - Round Tower: A steep climb that rewards visitors with an amazing view, once you get up there. - Trg Marafor: Located at the former site of the Roman forum, it still contains Mars and Neptune temple remains. - Sveti Nikola Island: Take a boat from Porec to the island to go swimming. - Zelena Laguna: Concreted bathing area great for swimming. - Ski Lift: Cable surfing and wake boarding. - Segway Tours: Use Segway to get to know most picturesque and romantic spots around. - Traktor Story: Various agricultural machines on display, including tractors. - Baredine Cave (aka Jama Grotta Baredine): Interesting monument of nature with a series of limestone caverns. Legend has it that lovers Gabriel and Milka got lost here in 13th century and died in the cave looking for each other. - Aquacolors Porec: One of newest and largest water parks in Croatia. - Motodrom: Adrenaline destination with go-carts, cross-karts, quad rides, paintball, and various other adventurous activities. - Vinistra: Wine festival in May. - Giostra: Festival about knights, with roots in the middle ages, held in September. - Beaches: There are lots of beaches to choose from between Cervar Porat and Zelena Laguna. - Meet Frank and Vera: Visit Villa Rupeni and learn all about Istria from the authors of Frank about Croatia blog. - Accommodation: Valamar Isabella Hotel, Valamar Riviera Hotel, Grand Hotel Palazzo, Hotel Porec, Valamar Diamant, Valamar Crystal, Pical Hotel, and Hotel Laguna Parentium. 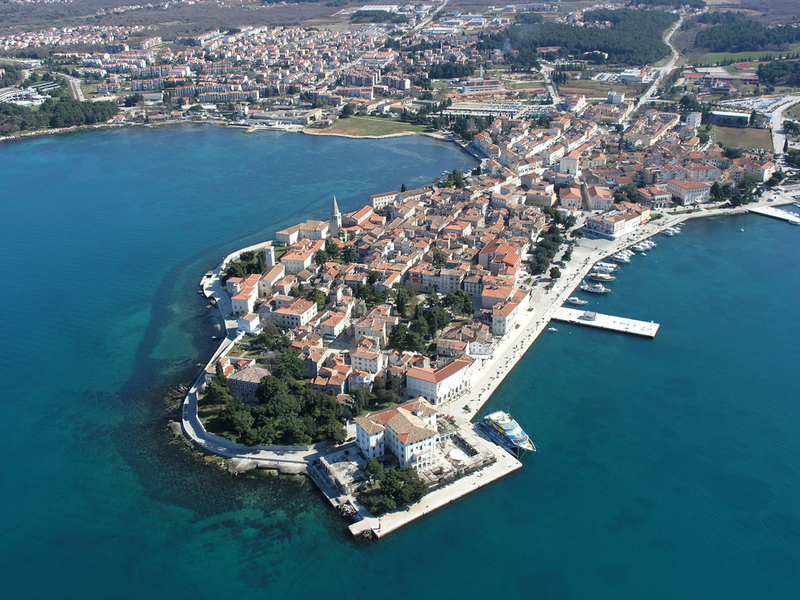 Additional information about Porec is available at Porec Tourist Board.